Friday’s daily candle on the dollar to cad chart ended the week of sideways consolidation for this currency pair with a narrow spread candle and with a deep lower wick, and the only significant aspect of the trading session was that the low of the day seemed to find support once again from the 9 day moving average. 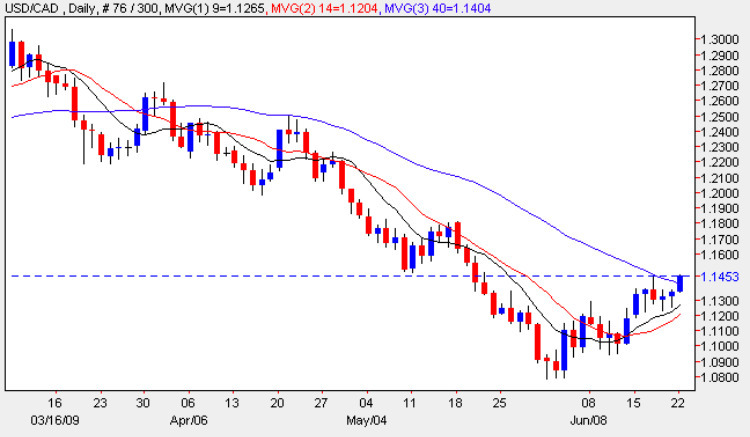 This price action is suggestive of the possibility of a sustained move higher which has duly evolved in this morning’s early trading session with a strong move higher by the US Dollar and the pair now sit above the 40 day moving average in the 1.1450 region. For this move to continue further we will need to see a hold above this average coupled with a break above the strong resistance now immediately ahead at the 1.15 to 1.17 region and should this subsequently be penetrated then we may even see a move back to re-test the 1.19 area in due course. The usd to cad pair is one of those which will be strongly influenced by any change of sentiment in both commodities and equities markets, and indeed this week I am expecting some volatile price action and a possible change of direction for the US Dollar as a result. The short term (or even the longer term) fate of the US Dollar now lies with the Federal Reserve and the statement due out later this week and the Treasury Auction. Currency markets have already taken a dim view of their quantitative easing programme along with China and Russia who are saddled with sackfuls of US Treasuries. The situation is not unlike that of the Cold War when each side possessed nuclear weapons of mass destruction which both knew could never be used as the result would have been catastrophic for everyone. With no items of fundamental news on the economic calendar for either the US or Canada we will just have to wait for the FOMC meeting, US GDP figures and Treasury Auctions later this week. My trading suggestion for the usd to cad is to stand aside and try to gauge the deeper undercurrents of the market.